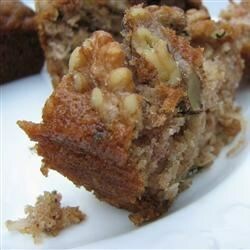 "A very moist flavorful zucchini bread. A great way to use up all that zucchini in the garden." Preheat oven to 350 degrees F (175 degrees C). Lightly grease two 9x5 inch loaf pans. Stir together flour, baking soda, baking powder, salt, cinnamon, and pumpkin pie spice in a bowl until well blended; set aside. Whisk eggs, oil, white sugar, and brown sugar together in a large bowl. Stir in sour cream, vanilla, zucchini, pineapple, and coconut. Stir in the flour mixture, mixing just until moistened. Divide batter between the prepared loaf pans. Bake until a toothpick inserted in the center comes out clean, 50 to 60 minutes. Cool in pans for 10 minutes, then remove and finish cooling on a wire rack. See how to make a super-moist, five-star quick bread. This is almost like the recipe I've created about 40yrs. ago, except I omit sour cream, and I added chopped walnuts...but this recipe is a very good one also!! Moist and delicious. I made small loaves for gift baskets and had rave reviews from everyone.